The wonderful world of Walt Disney has given us two characters that have reached so many people in many differnet ways, if you think about Mickey and Minnie i’m sure you feel good. This is an awesome cookie jar that features Mickey Mouse and Minnie Mouse in a very friendly hugging embrace, Mickey is in his classic red overalls and Minnie is in her cute red and white polka dots dress with the matching hair bow. With really fine details this is very high quality and is made from ceramic that is painted using bright vibrant colors, measures 10.5 inches x 8.1 inches x 10.5 inches and is a total of 4 pounds in weight. 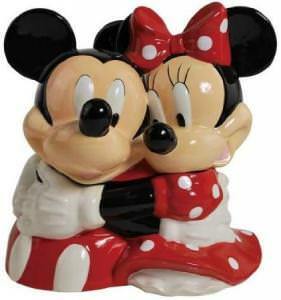 Keep your cookies in this Mickey and Minnie Hugging Cookie Jar. Sending holiday mail is one of those things we enjoy doing and getting. And this year your mail can be even more fun. Use these Christmas stamps with Mickey and Minnie Mouse to send you Christmas cards and parcels. The stamps come in a range of values and sizes and are a valid stamp from t he United States Postal Service. 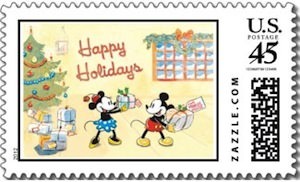 So if you want a special stamp this holiday then check out the Disney Mickey And Minnie Mouse Christmas Stamps. The wonderful world of Walt Disney has pretty cool and loved icons like Mickey Mouse and Minnie Mouse. 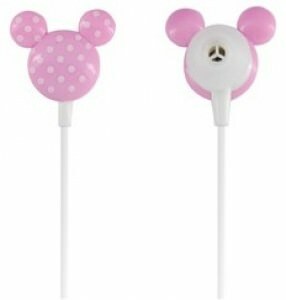 This is a pair of earbuds that are shaped like the head of Minnie Mouse, pink with white polka dots just like one of the cute dresses that you find Minnie Mouse wearing alot of the time. With great stereo sound and powerful bass these Disney Minnie Mouse earbuds are compatible with all electronic products with 3.5mm port, like MP3/CD/DVD/iPod/ iPhone and many many more devices. Have a closer look at the Disney’s Minnie Mouse Head Shaped Earbuds. The magical world of Disney theme parks have Cinderella’s castle as the focal point, the most memorable thing you will see. This is a cuckoo clock that features this amazing castle and to go along with it you will see great detailed images of 42 Disney characters all out front the Cinderella castle with Mickey mouse and Minnie mouse up front on the left and right. To anounce the hour with the twinkling sound of a magical wand you can find a tiny figure of Tinker Bell appear. Made from wood this 25 inch cuckoo clock is hand crafted and painted, it is a piece that can be cherished for years in a Disney collection. Get your Disney Character Cinderellas Castle Cuckoo Clock. The Magic of Disney is an irresistible charm that we all know and love, now you can illuminate the wonderful world of Disney in your own home. The Stained-glass is an artwork in it self but when you add the awsome accent of light in behind it takes this Magic of Disney to a whole new level. You will find 40 fun and loveable Disney characters on this Illuminated stained-glass including Mickey Mouse, Minnie Mouse, Cinderella, Goofy, Alice in Wonderland and more, much more. Comes mounted within a custom walnut-toned frame that measures 22-3/4″ W x 12-1/2″ H; 58 cm W x 32 cm H, and comes with a hanging attachment for easy display in your Magical Disney room. Get your The Magic Of Disney Illuminated Stained-Glass. Ultimate is a strong word, but this really is the ultimate Disney collectors item. 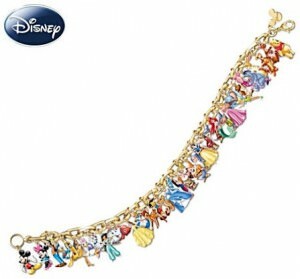 This is a classic Disney charm bracelet featuring 37 different characters from the wonderful world of disney, you will find Mickey Mouse, Minnie Mouse, Goofy, Donald Duck, Pluto, Pocahontas, Daisy Duck, Dalmatian Pup #101, Jasmine, Mrs. Potts and Chip, Nemo, Belle, Alice in Wonderland, Bambi, Pinocchio, Simba, Cinderella, Mulan, Grumpy, Doc, Happy, Sleepy, Snow White, Sneezy, Bashful, Ariel, Dopey, Sleeping Beauty, Dumbo, Tinker Bell, Owl, Piglet, Eeyore, Rabbit, Tigger, Kanga and Roo, and Winnie the Pooh all together on your Disney charm bracelet. All of the charms are hand crafted with amazing detail on each and the bracelet is 24K gold-plated and is adjustable up to 8 inches in length( 20 cm). It also comes in a collectable presentation case so you can show it off with pride and not even take it out of the case. Find out more about your Ultimate Disney 37 Character Charm Bracelet. Mickey Mouse and Minnie Mouse really do love each other, and we all love money. Here are the two things combined, a nice personal check with Disneys Mickey and Minnie mouse. You get 4 different desingns, each with Mickey and Minnie together in different cute poses. Get your Mickey Loves Minnie Personal Check Designs. Mickey, Minnie and Pluto will make any room an inviting room. These Fathead wall decals are great quality and there is so much care and detail that goes into this product, you and any one else will definitly love seeing these on your wall. 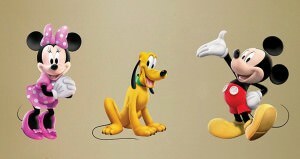 The dimensions are as follows, Mickey is 3’4″W x 3’7″H, Pluto is 2’5″W x 2’10″H and Minnie is 2’5″W x 4’H. Disney’s Minnie Mouse can bling it up with the best of them, this iPhone 4 case is made entirely of rinestone crystals and looks absolutely amazing on your phone. Show off your Disney bling just how Minnie would, and get great protection aswell with this easy to insert Minnie Mouse Crystal iPhone 4 case. 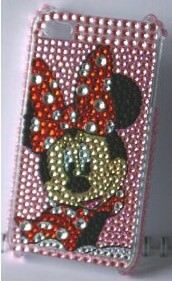 Get your Minnie mouse rhinestone bling crystal iPhone 4 case. Dress up your car with this 2011 Disney License plate. 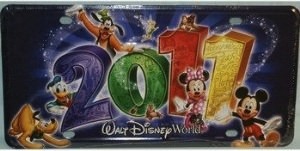 It of course has a huge 2011 on it and beside that you can find Mickey Mouse, Donald Duck, Goofy, Minnie Mouse and Pluto on it. This Disney plate will make a great item on your car and is great to collect to because a real fan would love to own one of these. Go check out this 2011 Disney License Plate.